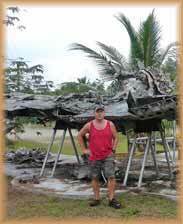 Pat has actively researched much of the history of WWII on Yap and recorded his findings on his website at www.MissingAirCrew.com and on Facebook at www.facebook.com/groups/missingaircrewproject. 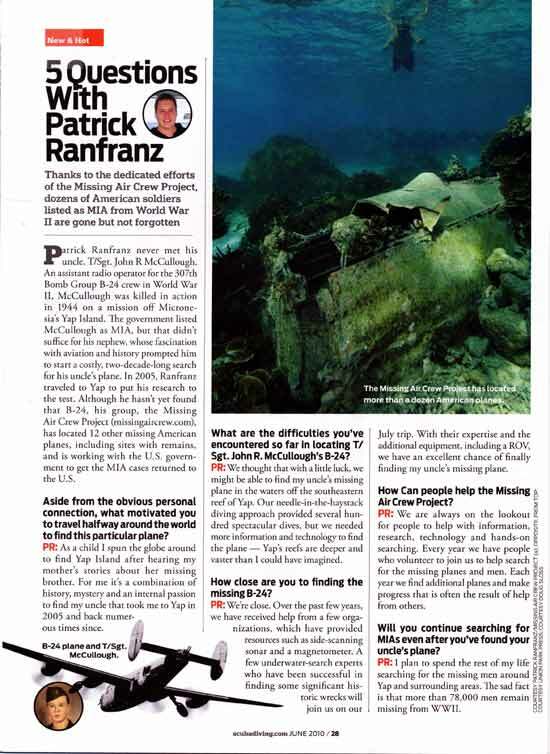 Pat has taken numerous trips to Yap Island since 2005, has visited the National Archives and other research locations, and made close to 100 dives to document more than thirty-five American planes and 110 men who were shot down near Yap and are still unaccounted for. In addition, he has received help from History Flight, www.HistoryFlight.org, which provided underwater search equipment such as side-scanning sonar and magnetometers. Along with aviation historian and founder of History Flight Mark Noah, Pat and his wife Cherie have visited Yap multiple times since 2005, assisting the Yap Visitors Bureau in saving the wreckage of a VF-20 F6F-5 Hellcat from a government landfill project. 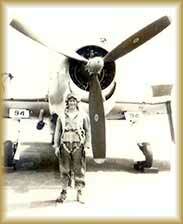 Lost over Yap on September 6, 1944, this aircraft was off the USS Enterprise. 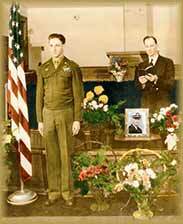 Flown by Ensign Joseph E. Cox, his remains were recovered and interred in a private cemetery in Idaho. Pat has generously offered to share his years of detailed research conducted for the Missing Air Crew Project with the residents of Yap and our visitors. 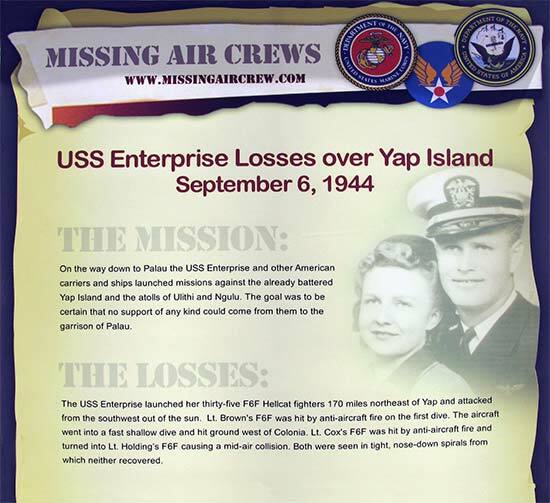 Since its inception, the partnership between the Yap Visitors Bureau and Pat has included creating memorial signs and markers to remember the missing men and planes as well as resources and training for the Yap tourism industry to document the WWII history of the island to share with visitors. A guided excursion can be arranged for visitors interested in touring these sights. 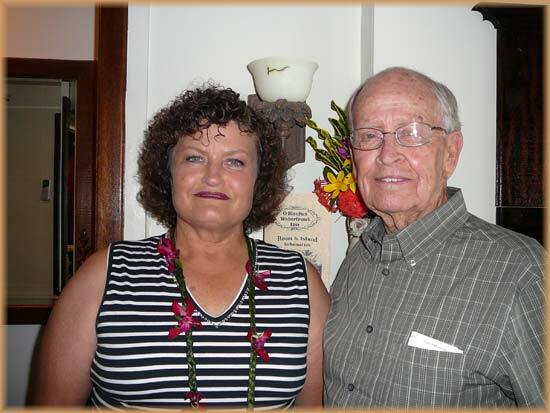 With a degree in History & Anthropology, Pat is the founder of the Missing Air-Crew Project and Historian for the 307th Bomb Group, www.307bg.org. He has devoted more than twenty years to the investigation and search for his missing uncle and other men who were shot down near Yap Island in World War II. In his “paying” career, Pat is a successful marketing executive. He spent sixteen years in educational publishing and is currently the marketing director for Rice Lake Weighing Systems, a world-wide private weighing company in Eau Claire, Wisconsin. 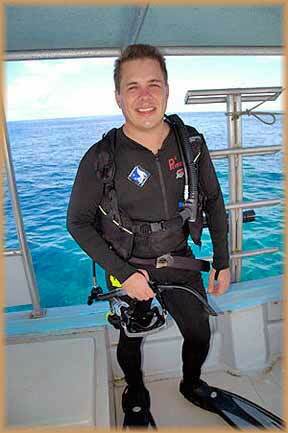 In addition, he is an accomplished private pilot, marathon runner, diver, historian and all-around sportsman. 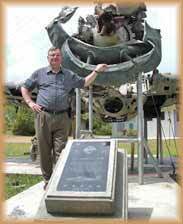 On July 27, 2010, The Yap Visitors Bureau (YVB) and the Missing Air Crew Project (MACP) dedicated one of the most unique World War II memorials in the Pacific. 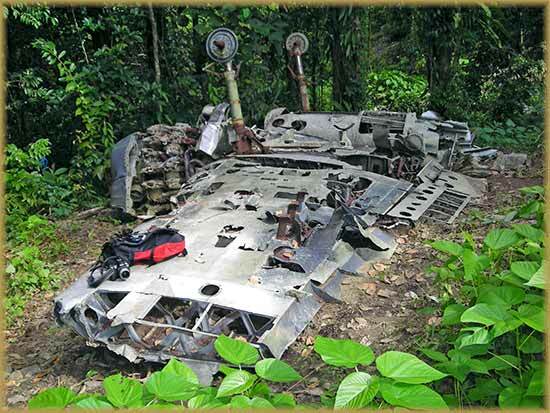 The site displays the wreckage of a plane flown by Ens. Joseph Cox (from Idaho), symbolizing the tremendous sacrifice and loss of human life near this Pacific Island during WWII. 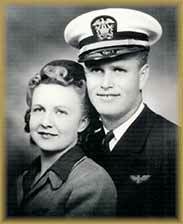 Additional pictures and information available at: www.missingaircrew.com/yvb/coxpr.asp. In the historical context of WWII and the Pacific theatre, American losses near Yap (now part of the Federated States of Micronesia) were substantial yet continue to be overlooked even today. Strategically located between the Philippines and Guam, Japanese-occupied Yap was targeted almost daily from June of 1944 to August of 1945 at the cost of hundreds of American men, 110 of which remain classified as missing in action (MIA). Attending the dedication were Yap Governor Sebastian Anefal, US Ambassador Peter A. Prahar and other dignitaries along with the 90-year-old brother of the pilot, Ellis Cox of Idaho. U.S. Ambassador participates in WWII memorial dedication. On July 24-28, 2010, U.S. Ambassador to the FSM Peter A. Prahar traveled to Yap State to participate in the dedication ceremony of the Ensign Joseph E. Cox Memorial, named in honor of a U.S. naval pilot whose F6F-5 Hellcat fighter plane was shot down over Yap on September 6, 1944. Members of the Cox family, including Joseph’s brother, as well as members of the family of Ensign Howard Holding, who was killed in the same mission, were honored guests at the ceremony. Yap State Governor Sebastian Anefal and Lieutenant Governor Tony Tareg also took part in the well-attended event. The Ambassador also recognized Mark Mathow, the brother of U.S. Army Staff Sergeant Steven G. Bayow who was killed in action in Iraq in 2005, and Robert Finniginam, father of Specialist Eric Finniginam, who was killed in action in Afghanistan on May 1st of this year. Representing U.S. Navy Commander of the Marianas (COMNAVMARIANAS) Rear Admiral Paul Bushong, Military and Civilian Affairs Commander Bryce Gibb thanked FSM citizens who fight alongside U.S. citizens in the U.S. Armed Forces worldwide. Cdr. Gibb rendered the military honors and presented American flags to the Cox and Holding families.